Stop your distracting dancing, Devil! I'm trying to write a paper! I’m supposed to be writing a paper. For my Early Modern Literature course. The due date for this paper was made plain as day on the syllabus I received in May. More detailed instructions were given to us two weeks ago, complete with helpful paper topic ideas. I have no paper. I have no paper topic. I am feeling a little screwed. The worst part about this situation is that, like a hangover, I know it’s all my fault. Actually, no. It’s not. Maybe it’s this blog’s fault because I simply couldn’t concentrate on anything paper-related until I fulfilled my self-inflicted, Internet-based responsibilities. And of course I couldn’t blog until I thought of something to blog about. My inability to find anything to blog about is, of course, the fault of the Vancouver Canucks, who, let’s be serious, have pretty much overwhelmed the hearts and minds of Vancouverites and I’m not sure any of us can be asked to think or do anything until the Playoffs are over. Obviously, the fact that the Canucks have to go to Game 7 tonight instead of finishing with a Stanley Cup win last Friday like I wanted them to is the fault of the Boston Bruins. To sum up, my paperless situation is the direct result of a “house-that-Jack-built” series of events, and the blame rests entirely with the Boston Bruins. There was simply nothing I could do. Unfortunately, life’s not fair. And even though the fact that I haven’t started my paper yet is ALL BOSTON’S FAULT, I’m pretty sure the writing of this paper is going to fall to me. Boo. It’s been a long time since I’ve had to write a university paper, and I’m not sure I remember how to. I’m also not at all sure I am an expert in Early Modern Literature. 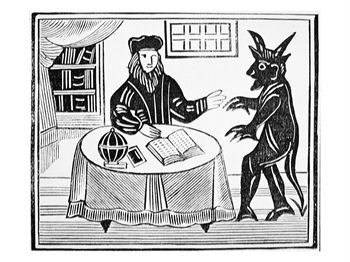 Perhaps, like Marlowe’s Doctor Faustus, I can exchange my soul for knowledge. Maybe I can move to the country described in Thomas More’s Utopia and live a very communist (albeit very monastic and Catholic) life free from concerns of personal academic glory. Hey Marlowe! I bet you know a LOT about Early Modern Lit. If you weren't dead you'd write a great paper about it, I'm sure. 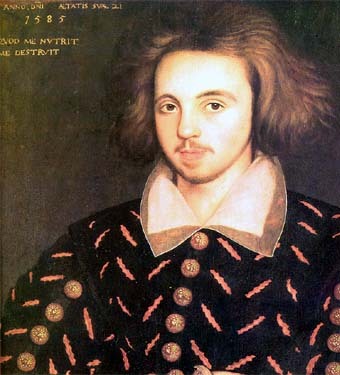 Hey, did you know that Christopher Marlowe (who wrote Doctor Faustus) was killed at the age of 29 by a knife wound to the eye sustained in a tavern fight? And that maybe he was an Elizabethan spy? And that other people in the tavern that day were maybe spies too? Suspicious. And exciting. But I digress (a lot). Ahem. Paper-writing. First thing’s first: are there dirty dishes in my sink? Because if there are, I’m going to have to take care of them right away. I can’t be expected to work in a messy environment. Once taken care of, and now that I’m in the kitchen, I’m feeling a little hungry. Having been exposed to continuous cries from bleeding heart liberals who say lunch programs in schools help kids think better, I am certain my paper writing will go a lot more smoothly if I have a snack. Making and eating a snack obviously dirties more dishes which need to be washed and set in the drying rack. And now, I sit down at my computer. As I settle into my chair I am presented with the niggling feeling that I need to go to the bathroom. Throw in paper-writing music, impromptu dance parties (caused no doubt by the music), and visits to Twitter to complain about aforementioned paper, and you can see I’m well on my way to unravelling the mysteries of Early Modern Literature in a concise, convincing, and intelligent manner.